The Makery in Milsom Street hosts a wide range of craft workshops, from brush lettering, to curtain making, dressmaking and floristry. They have a packed schedule with events most weekends. 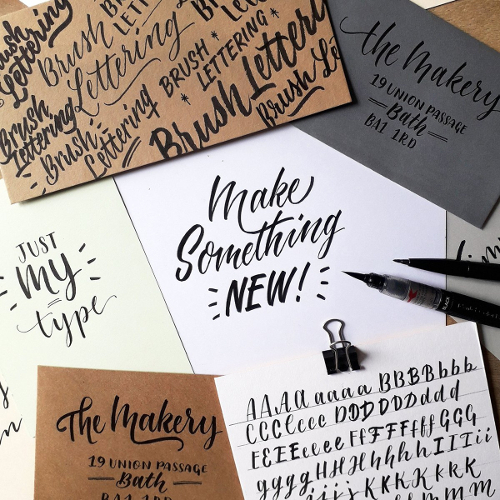 The Makery is an extremely well-established provider of craft workshops, and they’ve taught more than 90,000 people since they launched in 2009 – so you know you’ll be in good hands. Bath Artists’ Studios is based in the Old Malthouse and is home to 62 working artists. As well as regular exhibitions, talks and events, the studios hosts weekly classes and workshops on painting, drawing, sculpture, art journaling and much more. This is a friendly and enriching place to hone your artistic skills. Ironart of Bath hosts a one-day ‘Introduction to Blacksmithing’ course at their workshop in Larkhall. It’s a really unique experience tailored for complete beginners with plenty of time to make something entirely from scratch. These forging workshops are extremely popular and book up quickly so keep an eye on the link above for new dates. Try your hand at floristry with Tallulah Rose Flowers. There’s a good selection of courses, from the more casual half-day hand-tied bouquet events, to more intensive two-week career change courses. The Tallulah Rose Flower School is based in Milsom Street and you can see their full program of workshops here. Learn another ancient craft with Bath Aqua Glass’ glass making and stained glass courses. In the glassblowing course you’ll learn all the skills required to make your own glass paperweight, including shaping molten glass and applying colour. Another fascinating skill to learn, and impress your friends with.